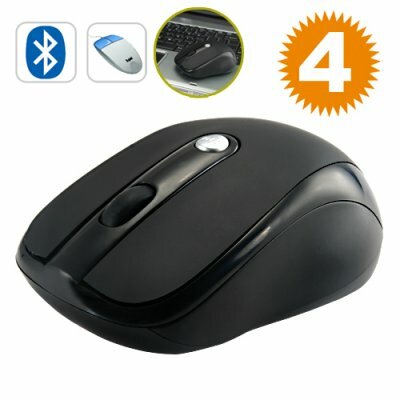 Successfully Added Bluetooth Optical Mouse For Bluetooth Computers (Ambidextrous) to your Shopping Cart. Don't let cables ruin your desktop. Upgrade to total portability with this Bluetooth wireless optical mouse. With this optical Bluetooth adapter, you can finally be free and enjoy your work without the restrictions of cables. So, whether you're left handed or right handed this Ambidextrous Bluetooth optical mouse is just the thing you need to alleviate the your desktop. Ergonomically designed for both right and left hand use with Bluetooth enabled computer. This fast-tracking, high-resolution, optical mouse with Bluetooth connectivity offers up to 33-feet of reliable wireless transmission making this ambidextrous Bluetooth optical mouse ideal for use in meeting and board rooms. This compact and ambidextrous Bluetooth desktop mouse is only designed to work with Bluetooth-enabled computer systems, thus eliminating the need for a separate receiver dongle. With the internal high resolution optical sensor, this wireless optical mouse provides precision and accuracy in cursor control and fast tracking for improved productivity. This convenient Ambidextrous Bluetooth optical mouse is in stock iun our warehouse right now and will ship out the same day you order it - guaranteed! İts is a good product. Battery life is best. İtem is normal quality. Bluetooth Optical Mouse For Bluetooth Computers it is a good product well done chinavasion excellent for this.